I found this great blog post about food photography this morning via Twitter and the Snapseed app was recommended for iphone, so I thought I'd try it out, it has more functionality than Instagram and you can transfer your photos via Instagram, or email and most of the other popular photo hosts as well as sharing via social media. Anyway back to the Breakfast Club which is being hosted this month at The Chocolate Log Blog by the lovely Choclette. It was no surprise that Choclette chose 'chocolate' for the Breakfast Club theme. Now I don't normally eat chocolate for breakfast, but remembered that I had a little chocolate sauce left over from a dessert, it had solidified in the bottom of a ramekin in the fridge and there really wasn't enough for more than one person. Choclette featured Chocolate Porridge as her breakfast recipe, but took a different approach. I used the lovely Flahavan's Irish Steel Cut Oats again and made my porridge with milk but no sugar, then softened the sauce in the microwave for 20 seconds, spooned some into the porridge and swirled it around. It took me right back to my childhood when I used to love to put a spoonful of black treacle into my Farley's rice, anyone remember that? 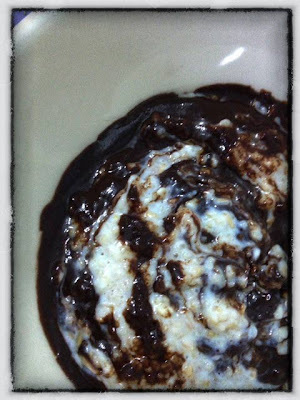 I have to say that I probably put too much chocolate sauce in the porridge, but it was VERY good! To take part, make a breakfast which includes chocolate in some way, shape or form and post it. Mention Breakfast Club and use the logo. Link to the Breakfast Club page and to Chocolate Log Blog. You are welcome to send in old recipes, but please add the information above and republish. Entries can be sent to other events, but please respect their rules. If you tweet please use #blogbreakfastclub. All breakfast clubs are also blog hops, so do feel free to grab the code and add to your page. Entries to be in by midnight on 25th November please. Too much chocolate, nah, it looks great! Sometimes I have chocolate spread on a slice of bread for breakfast, but including chocolate in porridge sounds good as well. Janice, what a great idea. Chocolate sauce must make a nice change from honey, which is what I sometimes put on my porridge. It's a lovely dark colour too, so you must have used just the right amount of chocolate! Thanks for joining in with Breakfast Club. Thanks for pointing me in the direction of the photo app too, I might try it out. I love my porridge - adding chocolate can only be a good thing - surely?! That looks great - really dark and delicious and I don't think there's ever such a thing as too much chocolate, even for breakfast.